I never thought about how difficult it is to name an inanimate object until I started writing patterns. At first, I went the more or less literal route with, for example, Chunky Feather and Fan Scarf. Perfectly solid name, holding no surprises inside. As time went on, I felt the urge to be a bit more creative, especially when designs seemed to multiply like Tribbles (if you don’t know what those are, your nerd card is hereby revoked.) Now, I’m at the point where I want to convey a mood or highlight some sort of design inspiration. That actually makes naming a more daunting task because, well, I say “potato”, you hear “cheese”. So wither cometh the Freddie Cowl? The name for my latest design was born in an English country manor; all tweedy and hunting weekend comfortable. The name that popped up was Winifred so I nicked it down to “Freddie”. All friendly and at ease, Freddie is a cinch to win the contest for its quick-knitting good looks. The diamond leaf inserts tucked in the ribbing I think add a special touch. 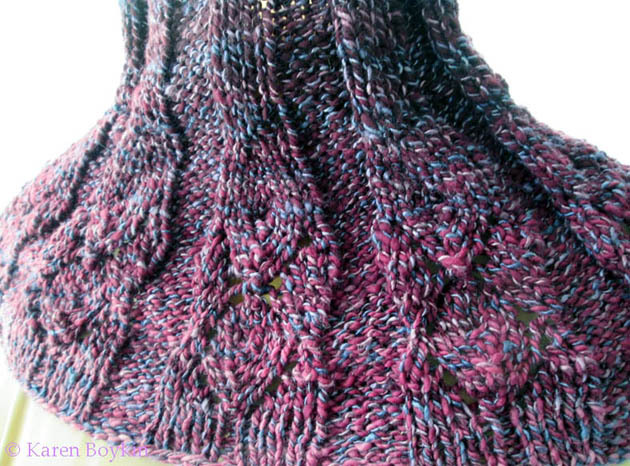 The patterning has the intertwined look of cables but without any of the bulk. So go ahead! Pull out that special Aran or chunky weight yarn you bought 3 years ago (What? It was beautiful! ), add size 10 US / 6.0 mm circulars or dpns, and it’s done in a matter of hours. I knit the sample in hand spun and dyed wool with a dusty blue silk wrapper, courtesy of the talented Lisa Mendez (artgirl60629@yahoo.com). I only intended it as a gift for my mom but I kept actual notes and thus Freddie was born. 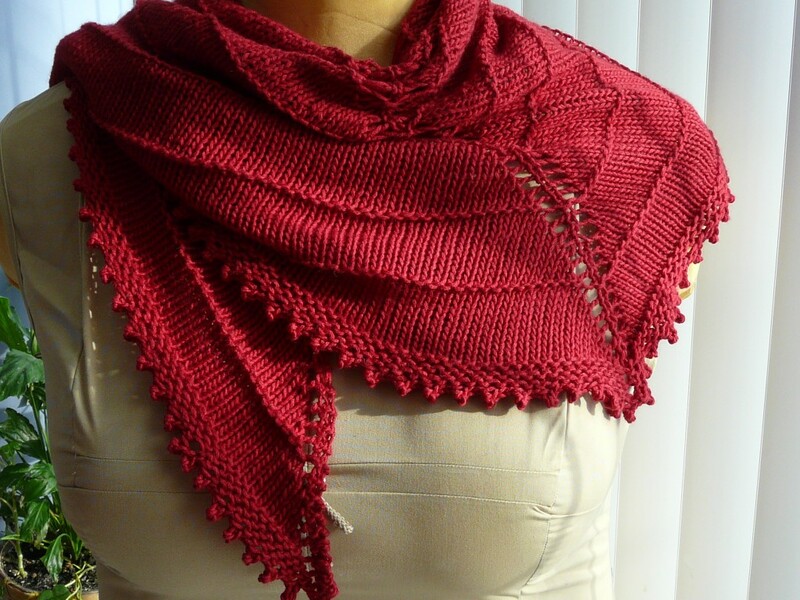 You can buy the Freddie Cowl pattern from The Yarn Is My Metier store on Ravelry. Easy (knit in the round, purl, make 1, knit together, pass slip stitch over, yarn over). 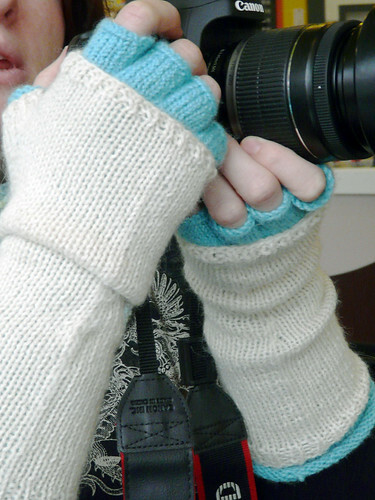 There are other designs on deck as you might expect, including a special request for mittens. What do you think? Should I be bold and return to my roots? Why not call a mitten, Mittens! I’d intended for that lone ball of Freia Ombré Sport to be a featured player / proof of concept in an avant garde design I’d been working on. 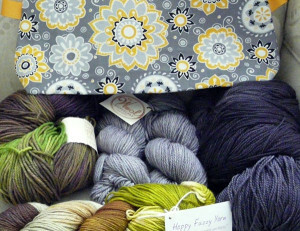 Even though the design went into hibernation, the yarn flew to top of mind when I saw Carina Spencer’s Zuzu’s Petals. It was designed with ombré yarn in mind. The pattern is very straightforward and easy to follow, but there may be a couple of things that might trip up someone new to circular knitting. The first potential stumbling block? Understanding how to start off knitting rows to establish the shaping for the top of the triangular cowl, then joining the now 16″ / 40 cm wide section into a circle. There’s no trick to it. Just remember to finish your RS row then join the beginning of that same row in the round. Proceed with the simple lace pattern from there. I also advise you heed the advice to do a stretchy or lose bind off. Once you try to block the piece, you’ll understand why that is key. Word of warning: you will notice that the center YOs shift by one stitch once the lace portion begins in earnest. You’re not doing it wrong. That’s just how the pattern is written. This little quirk doesn’t take away from the beauty of the finished product in my opinion. It’s attractive, easy to slip on, and the perfect shot of color over that denim or leather jacket. You might find yourself wanting to whip out more than one! We’re already wading hip-deep into September; school has begun and night time temperatures cooling. That doesn’t mean there’s no room for a bit of late-summer show-and-tell! First, the hats. I am not a pale person andone might not expect me to sunburn but I do. That’s why I decided to try my hand at crocheting a hat to stave off the rays and keep my sallow face from taking on the look of a red-nosed Santa. 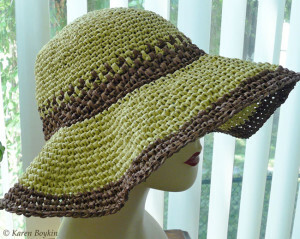 I was browsing around the Internets looking at styles and found that I really liked the look of raffia hats. The issue for me is that natural raffia is very hard on the hands. I found my solution in the form of raffia ribbon, most often used as gift wrap or for tying bunches of flowers. I know it probably wasn’t meant to be used to make things like hats or bags but, hey, why not give it a go? Even if it tore or came apart from the stress of being crocheted, it was a mere $25 investment in materials. A little experimentation was in order. First, I needed to get the feel of working with the material and secondly, I had to find the right size hook that would make a dense enough hat to fulfill its sun-blocking duty. I settled on the H (size 8 US / 5.5 mm) hook. 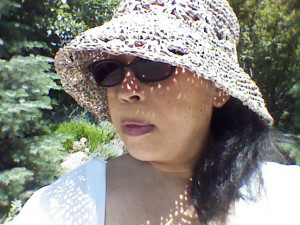 Using my usual crochet hat recipe (what I call “flat crown, then down”), I quickly freestyled my way to a cute sunhat. A friend of mine decided she wanted one, too, although she opted for more of a boho-style with a floppy brim. My takeaway here? Don’t be afraid to experiment with unusual materials. It just might turn out to be something really special and uniquely you. Oops! Almost forgot the table runner. A friend of mine was working on updating…no, completely overhauling her condo, looking to add bright colors and warmth to her space. Along with acting as a sounding board for her choices, I also decided to make her a one of a kind birthday gift – something to spruce up the catch-all table be the front door. That’s how the table runner was born. 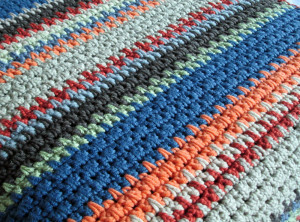 I used at least eight different colors of worsted weight cotton blend yarns from stash. At first I tried to plan the color sequence but gave up at a short time, opting instead for the gods of random to take over. My only rule was that one color could not repeat too quickly. Oh, and to remember to alternate wide and narrow bands of complementary. 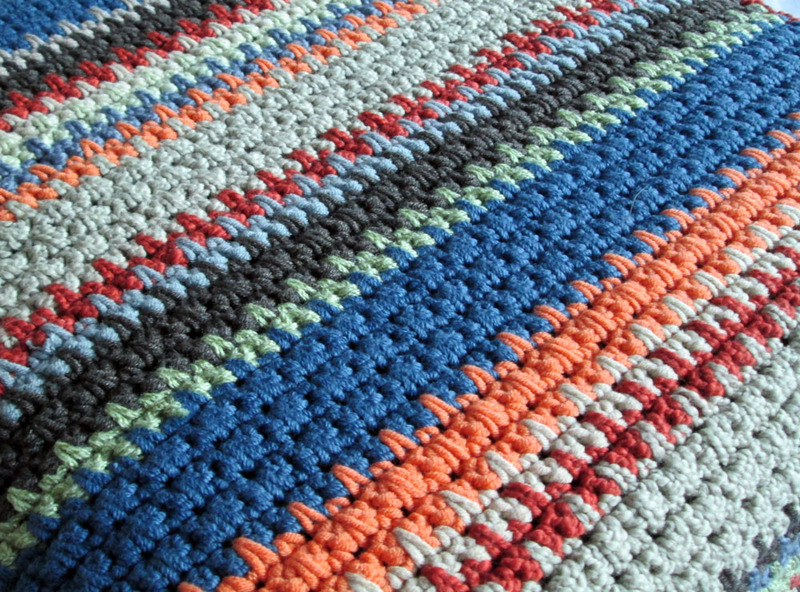 Can’t say how much yarn I used but the runner was crocheted with a size H (5 mm) hook in an alternating spike stitch pattern. What started as a (very) belated Christmas gift for a friend has turned into my latest pattern. I’d like to present the Slippery Vine Wrap. The piece consists of a deep, slip-stitch textured border bracketing a meandering vine lace center. Sounds like something quite delicious – and it is! The Slippery Vine Wrap pattern is available in two sizes: Tucker, which is just long enough to slip inside your coat to ward off a chill and Largo, its generously-sized cousin, suitable as a lovely wrap. The pattern is available for purchase and download through Ravelry. I snipped threads that were made decades ago. I had to. 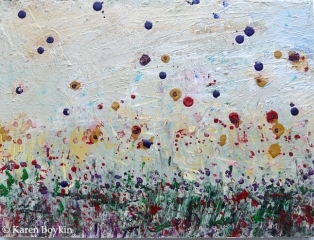 That was the only way to release the aging canvas from the prison of nails that held it to its old wooden frame. 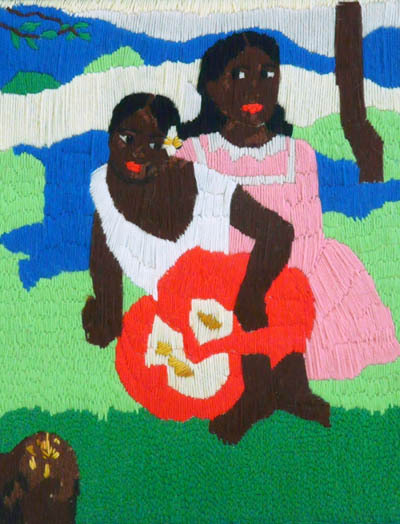 I sewed my crewel-work version of Gauguin’s “Nafea Faa ipoipo? (When Will You Marry? )” many years ago as an entry in an art contest when I was 13. 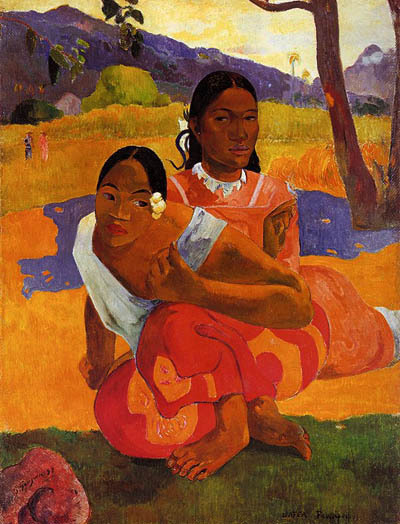 My mother had a print of the famous painting from the artist’s Tahitian period and it had always captivated me with its bold, colorful depiction of exotic beauty and youth. Unbeknownst to me, mom kept my old hand-sewn version, moving it from place to place over the years, leaving it in a closet or propped up against a wall. Although there were some areas needing repair, I gave myself a quiet little psychological pat on the back for how well I captured the lines and shadows of the picture. Instead of re-framing the picture, I wanted to renew it. I looked through my stash for yarn that was a fair approximation of the colors in the places that needed to be re-sewn; not easy when the original source of the yarn was the giant wall of bright acrylics at Woolworth’s. Actual wool and alpaca would have to do. First up, a sponge bath with a mild wool wash. After drying, sew-sew-sew. Lastly, stretch the canvas on a new frame and finish the back, preparing it to hang proudly in my mother’s home once again. It’s been renewed and re-gifted. Happy Mother’s Day, mom! At some point, it becomes impossible to play catch-up. I’d say that two years since my last blog post falls in that “impossible” column. The task then becomes to determine exactly what makes the highlight reel. Let’s play this LIFO-style. Not only was YarnCon, Chicago’s indie fiber fair, better than ever in its new home at Plumbers Hall, I was actually invited to teach one of the workshops. Who doesn’t love learning a couple of new crochet stitches. Bullion or bobbles, anyone? So many friends – old and new. And yarn. Lots of yarn. I did what I could to support the local crafting economy with a couple of judicious purchases. My body was one giant ache but my spirits were light and happy. I got to spend the day playing with my peeps. Hats, scarves, even a couple of capelets have come off the needles in the past two years. I really enjoyed the near-instant gratification of turning Malabrigo Rasta into Ovate – so much so that I made two of them. But my adaptation of the Ruffled Collar Capelet remains one of my favorite things. The pattern calls for Artyarns but since I had none in stash, I went with Rowan ASC in Concrete. It actually mimics the color of the pattern capelet, just not as drapey or refined. I found some slubbed cotton with a silver thread running through it (also in stash) to add texture interest to the collar and the bottom of the capelet. I even added a row of clear beads, giving the finished piece the look of snow hanging off the bottom. Yes, there are other things besides knitting and crocheting. I’ve been writing a little and ─ wait for it ─ painting! I was getting a sip of water at the local art center drinking fountain when I happened to see a card announcing a juried exhibition. At first I dismissed it as an impossibility: there was only one week before the deadline and they probably wanted “real” artists anyway. I’m glad I didn’t listen to my defeatist inner voice. 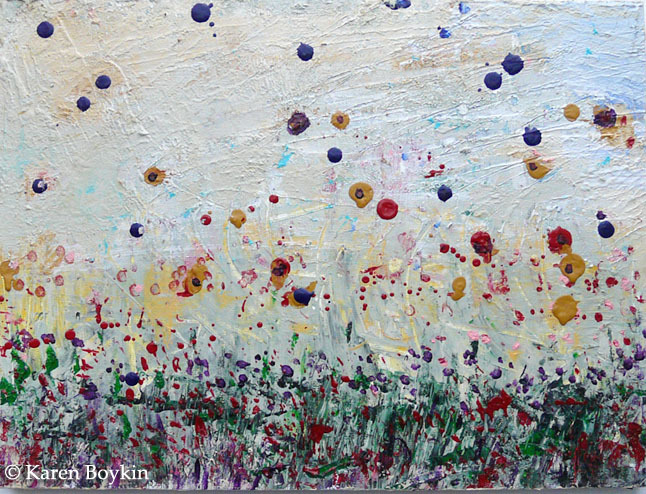 I had three canvases lying about, collecting dust. All they could do is say, “No.” Good thing I checked the spam folder or else I might have deleted the email announcing that I’d been accepted for the show. My head and my sketch pad are positively volcanic explosions of ideas! I can’t show any of them as it wouldn’t be proper etiquette, according to the considered opinion of other knitwear designers. What I can do is speak in general terms about the submission process and – at least for me – the difficulty of translating visual ingenuity into a workable written pattern. Most publications want 3 things: a sketch, a swatch, and a story describing the design and why someone would be compelled to knit or crochet your creation. Sounds simple enough, right? Yes and no. If you think the 15 days between the time the request for submissions is announced and the day the design is due is just about sketching and swatching, you’re in for a rude awakening. Test swatches also require you to figure out the placement and rate of increases and decreases. Easy enough if your fabric is straight stocking or garter stitch. Oh, you’ve designed a beautiful 16-row, 20-stitch lace repeat into your garment? Your design life just became substantially more complicated unless you can easily answer the question of how you plan on incorporating increases in pattern, as well as matching any construction requirements of the garment to the stitch pattern. This is why it’s wise to plan a two-pronged attack when it comes to submission deadlines. Why? Suppose your design is selected. Congratulations! You’ll have to make up a sample for the publisher using your pattern. Oh, you don’t have a pattern? If you’ve successfully sold your vision without at least the shell of a pattern and copious notes to back it up, you may have just stalled out your budding career as a designer. The publisher is counting on you and you’ve just put them – and yourself – behind schedule. No one wants to scramble at the last minute because you failed to plan appropriately. Ratchet back some of the fantastic design features, especially if you need to create unusual fabric patterning from scratch. Give yourself time to the let the design (and your skills) mature so that you might come closer to matching your unique vision to a workable reality. Work off your own timeline and go the self-publishing route. I’ve done a half-dozen or so patterns so I have a small taste of the difficulty inherent to creating repeatable, consistent instructions. However, as much as I wish it were so, design for professional submission requires more than pretty pictures. It also requires dedication, skill, and vision. It wouldn’t hurt to grow a thick skin to bear up under inevitable rejection, either. Despite all of this, I knit and crochet on. Hopeful. How do you manage to meet the demands of the design process? Perhaps I’ve overlooked something. I’d be grateful if you’re willing to share your insight. I thought for sure that my friend T’s Rikke would spell the last of my winter knitting. I figured that she’d have very few chances to wear her hat, which was the last of a 3-piece gift: Rikke, Strata (from “Knitting New Mittens and Gloves”) and Eleanor. Har-dee-har-har. There is actual snow on the car hoods this morning. Not much but it was snow! The average temperature for this date is supposed to be closer to 60 degrees (F) than to 32. Not funny, weather gods. 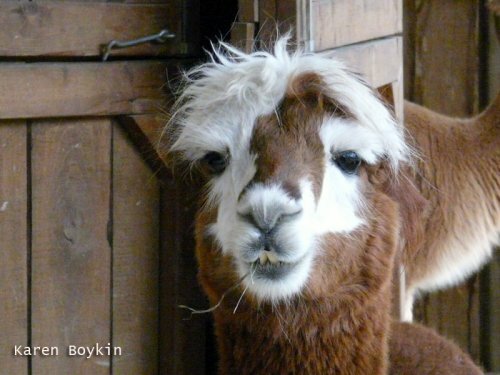 Well, at least I don’t feel so bad about talking up my woolly adventures with alpaca(s). That, and a mug of coffee should warm me up – some. The plan was to knit accompanying pieces that went together but that did not necessarily match. I made the first layer of Strata with Blue Sky Alpaca sport weight in Capri blue. This was my first foray into making fingers although I’ve made an uncountable number of mittens and fingerless mitts in my time. It turned out to be a lot easier than I thought. The only caveat? 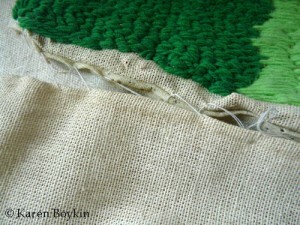 Make sure to save a bit of yarn to stitch up and secure any gaps between the digits. 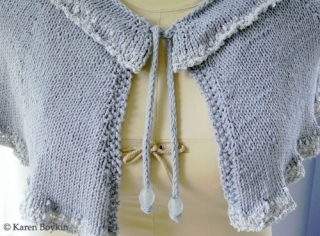 The fingerless cream-colored Plymouth Indiecita alpaca top layer was a breeze by comparison. The only digit required is the thumb. I thought the German Twisted Cast-on would be difficult. At least it looked complicated the first time I saw the YouTube videos. I recommend watching 2 or 3 to get the hang of it as each person explains a little differently. How this cast-on manages to be both firm and stretchy is beyond me. I’ll chalk it up to a touch of knitting magic! 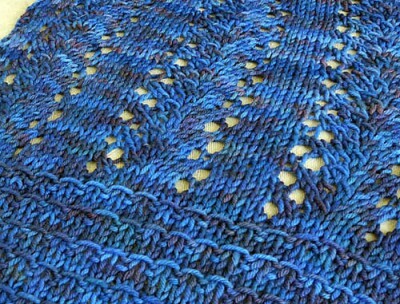 The only issue I had (and I’m not sure why) was snugging up the stitches when switching needles during the decreases. I took corrective measures with a tapestry needle afterwards. For T’s Rikke, I cast on using the remainder of the KSD from Knitty’s Eleanor, completed in mid-November 2010. The 100 yards of remaining yarn formed the first 3 inches of Rikke. The body of the hat was done using Blue Sky Alpacas sportweight in the Capri colorway, held double with cream-colored Plymouth alpaca. 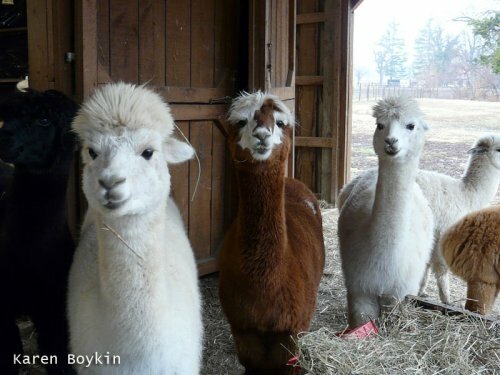 Once that ran out, the crown of the hat and remaining decreases were done in cream-colored alpaca only. I love how it turned out! Oh, and did I mention I made one for myself? Except mine was made from one skein of bellamoden’s sport weight yarn in the Fahrenheit 451 colorway. 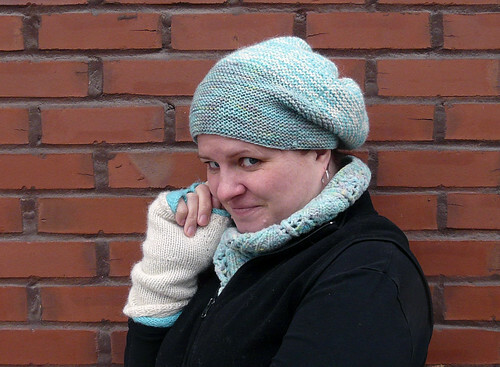 This hat, along with my version of Stephen West’s Boneyard shawl became my “go to” gear this past winter. Both have seen a good bit of wear but they still look fantastic. 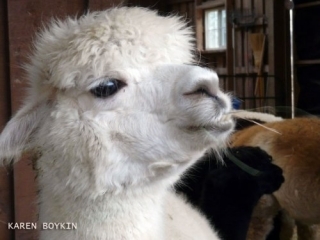 Have you ever thought about adopting an alpaca? Well, that’s exactly what a group of friends did for Pirate Alice’s birthday (erstwhile alpaca farmer back story). 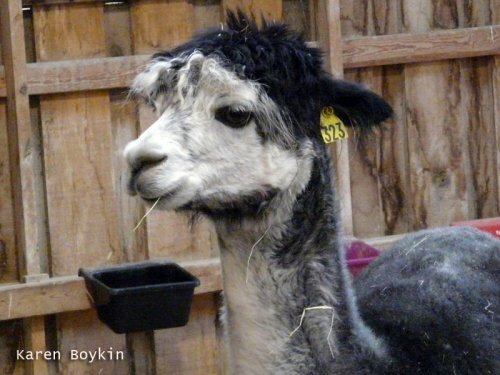 We would occasionally talk about going to the farm where her alpaca lives but it was talk that came to naught. That is, until the fates intervened during the Chicago Auto Show. 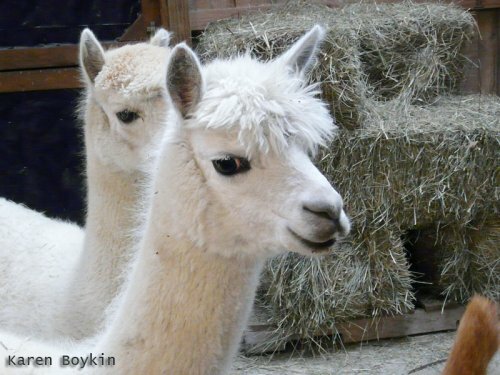 A media blogger friend of ours was given an SUV for a week and AlpacaQuest was ON! The four hours to the White Violet Farms in southern Indiana were worth it to see and feel the wool on the hoof, so to speak. It was a chilly rain and mud kind of day but with these faces, no one was complaining! And West is West – Stephen West, that is. Don’t know what you may have heard about this talented 22 year old designer, but I find his take on the humble shawl new, simple and fresh. How someone came fashion stockinette, garter stitch and geometry into flattering shape and movement is beyond me. A bit of hyperbole? Maybe. There is, however, no denying the modern beauty of his designs. 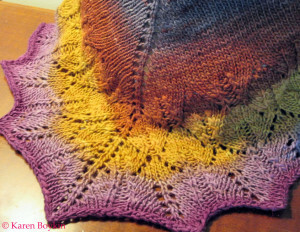 One of West’s first designs, the Boneyard Shawl, was my first of his knits as well. 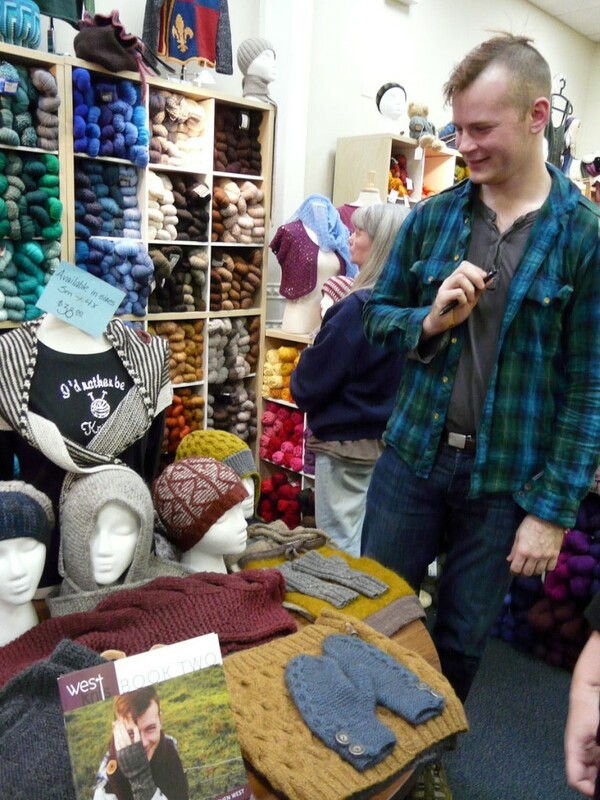 Of course, I had to wear it to his recent book signing and trunk show at Chicago’s Loopy Yarns. Lanky, unassuming and a bit shy, West seemed grateful for the welcome home after spending the past few months in Amsterdam. Somehow between studying dance, he published two collections of designs. The first book focuses on shawls and scarves, while book two branches into hats and mitts. I do love a trunk show because you can touch the fabric and see how the choices of color impact the design. You know where I’m going with this. It also tempts you to a) buy the patterns and b) buy the yarn to make them. Fortunately, my yarn stash is deep so the problem of yarn-to-knits ratio is moot. I did gave in to Book One but just so you know, the patterns can also be purchased individually, either through WestKnits or directly through Ravelry. 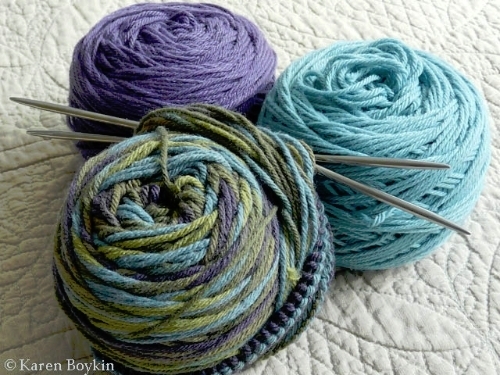 These three will make it into my Ravelry queue sometime this year: Akimbo, Daybreak and Pogona. If you like Daybreak or Akimbo, be aware that they were among West’s first design releases and are therefore NOT included in either of his book collections. There are still one or two things I want to make before any one of these hit the needles. February may be nearing an end but we’re still subject to wet and cold in Chicago.